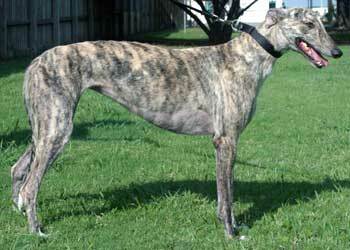 Holly, aka Hilltex Heidi, is an attractive almost 2½-year-old light brindle female, born May 9, 2005. Her sire is the late Gable Dodge and her dam is Fuzzy's Bomber. 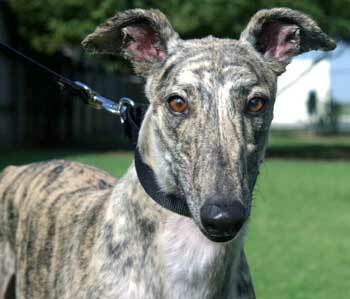 She is sister to Taffy, and both of them, along with Sissy, were the last three greyhounds in the inventory of A Place For Us Greyhound Adoption* in Albuquerque, New Mexico, which is closing down. 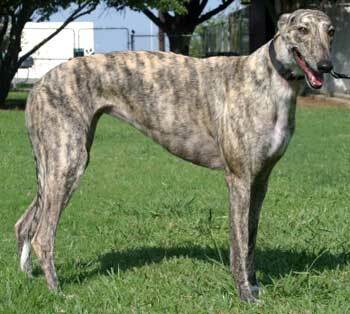 There is no record of Holly on Greyhound-data.com. Holly is a little on the reserved side. Holly passed her cat test. She got to meet all three cats and had the opportunity to see them in action walking around on the floor, sometimes right under her nose. Dom seems fine with her. He's the older, most dog-savvy judge of character. Carbon actually touched noses with her and rubbed around on her legs a little. Otherwise, she's not really interested in being face-to-face with them. Holly passes, with close supervision, of course. Holly isn't demanding of affection - at this point in time, anyway - but seems to appreciate it when coaxed. She's getting along greyt with the other Greyhounds of the household for her cat-testing.